The first season of HBO’s Westworld played with its sci-fi narrative by cutting back and forth across different time periods, most notably between two characters — Jimmi Simpson’s white-hat William and Ed Harris’s Man in Black — who ended up being the same guy. Eagle-eyed fans picked up on the twist almost immediately, even as the first season unfolded across three major timelines. But this time around, the mysteries will be a bit harder to deduce. From what we saw in the first two episodes of the new season, Westworld is up to its old tricks again, and they’re knottier than ever. Let’s break down exactly what is happening when, in chronological order. Be warned, though: It’s only going to get more complicated from here. The season-two premiere begins in what we thought was the distant past, with a scene shot in a different aspect ratio than the rest of the episode. We see Arnold and Dolores discuss the nature of humanity and dreams, although the tone of their conversation is notably different than it was in season one: Arnold often spoke to Dolores about what it meant to be human last season, but the roles have been reversed here as Dolores now asks the questions. Of course, this is designed to reflect the reversed roles of human and host after the Dolores’ uprising in the distant future. In episode six, we see this conversation again … or do we? We learn that Dolores is testing Bernard (or possibly another host that looks like him) for “fidelity” in a scene with that aspect ratio. Is the season-opening scene the original conversation with Arnold, or the first half of a future conversation with his host clone? There could be two timelines here or just the one in the future, with Dolores recreating a conversation she had decades earlier. Given how both scenes use the same aspect ratio we see when Bernard goes into the Cradle, when, where, and how these scenes are taking place is even muddier. Stay tuned! The second episode, “Reunion,” opens with Dolores being “brought back online” in the real world! But she isn’t the revolutionary leader we’ve come to know this season; she’s the old, wide-eyed Dolores who sees splendor in everything. In this timeline, which also takes place in the distant past, we see Arnold Weber showing Dolores the world outside of Westworld. (Although, one never knows in the world of this show what could be a simulation.) It sure looks like Arnold is introducing Dolores to his world, and we even hear from young Dr. Ford as he asks if she is ready for the presentation. She isn’t, but plenty of other Westworld hosts are sent out to impress young Logan Delos, who clearly hasn’t visited the park yet. Here’s the most fascinating wrinkle: In the post-revolution timeline, Dolores remembers this off-campus adventure. Was it the true beginning of her awakening, or has she learned to access long-dormant memories? And what else does she remember? It would’ve been mind-blowing to get one off-site adventure in “Reunion,” but the episode visits the real world yet again in a timeline that follows William’s rise to power. 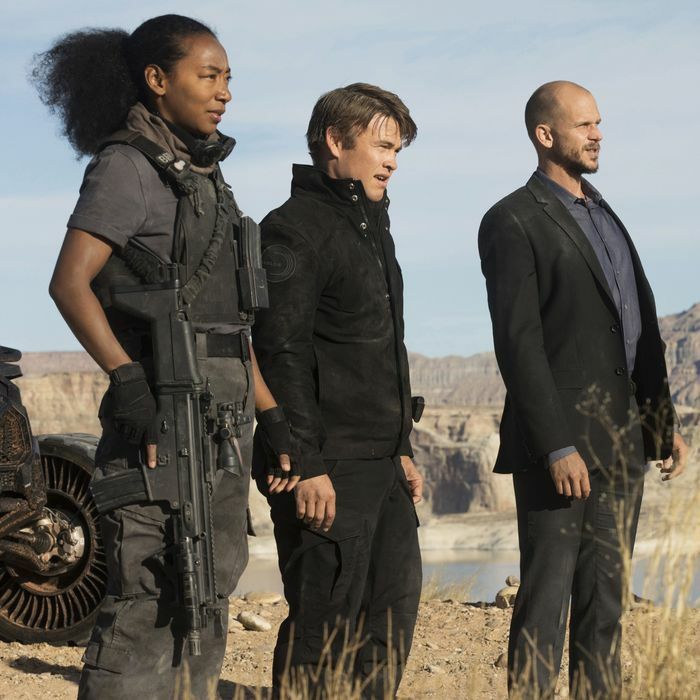 In the first of three major sequences, Young William returns to Westworld with his father-in-law James Delos to pitch him on the park’s potential. Then, after an undefined period of time, we see William and Logan at the elder Delos’ retirement party – an event that once again pulls Dolores out of the park, and for which she now seems to be capable enough to play the piano. Late in the episode, in a scene that appears to be set near Westworld’s train platform, William finally brings Dolores back online himself. How much time passes between each of these scenes? We don’t know, but it’s clear that William now occupies a very powerful leadership role within Delos and the park. A good chunk of the season takes place shortly after the massacre: Dolores and Teddy are chasing their revolutionary aims, Charlotte and Bernard flee to a secret laboratory and search for the Peter Abernathy host, Maeve and Hector take Lee Sizemore as their prisoner, and the Man in Black finally begins playing the game of his dreams. The big question here: Are there multiple timelines within this narrative? Are the events not unfolding simultaneously? It’s certainly possible, although there isn’t much evidence to suggest that quite yet. Waking up on a beach, Bernard — well, maybe it’s Bernard — meets a Delos power broker named Strand, who indicates that it’s been two weeks since Dolores began her massacre. Strand needs information from Bernard, and this timeline follows the quest as Strand’s team cleans up the mess from the revolution and searches for … something. (Are they looking for the Abernathy host?) At the end of the season premiere, they arrive at a lake filled with dead hosts – including Teddy – and Bernard suddenly takes responsibility for whatever happened. “I … I killed them,” he says. “All of them.” This near-future timeline clearly takes place after all of the others.